Before I get into my own very personal view and experience in this article there is an important disclaimer to identify. Wherever you are geographically located there will be legislation and processes governing the technicalities of letting a team member go. It is important that you thoroughly understand what those processes are before pushing the big red button on a staff member. So, with that understood, what are the key things to consider when you feel the time has come to move someone on? The first thing to consider as a business owner is whether the problem is the team member or whether the problem sits with the way you manage them. Any idea that you may have that as a business owner you get to take your place amongst the great communist leaders of history needs to be quickly dispelled. Just because you own a business, that does not mean every decision you make is right. So, a bit of self-reflection here is a sound investment. If, after this brief journey of self-discovery, you look yourself in the mirror and say the problem genuinely sits with the team member then read on. Let me show you want I need. In keeping with the self-reflective mood you should now be in, try to determine if you have given the team member every chance to succeed. Have you clearly explained what your needs and expectations are? Does the team member have the resources, tools and equipment required to do the job? Have they had the necessary training and development? Importantly, is this the role you hired them for or did you just slip them into a vacant seat? Let’s assume that after a bit more gazing into the mirror you have concluded that, yes, in fact you have got all this covered. They were perfect for the role and have everything they need to do the job. They have a clear understanding of your very reasonable expectations. They simply aren’t cutting it. Earlier in my career, when confronted with having to let someone go I was given some advice that has stuck with and it has served me well. Always remember that every person that leaves your business becomes an automatic member of the ex-employee club from your business brand. What this means is the way you treat people when they are exiting or being exited will be talked about and there’s nothing much you can do to stop it. Ending a person’s employment also comes with certain personal responsibilities. For the sake of their well-being and your conscience it would serve you well to handle this with kindness and care. Some team members take the news better than others. The key here is that when firing someone, it should never come as a surprise to them. After your self-reflection and consideration of the emotions involved, the next step is the “Hop, Step and Jump” approach. The “hop” part is dealing with the verbal discussion at the start of the process. Talk to the team member about specifically what is not working out and why. Explain in a calm and professional manner what your expectations are, why they are not being met and what you need the team member to do about it. Hear what they say, and discuss their concerns and situation as well. Remember your mirror moment and be open to what they tell you. Confirm after this stage what was discussed in a letter and remember everyone involved is a real person with real feelings. Approach from the position that your discussion will have been well received and that changes are on the horizon and everyone is moving in the same direction. If not, move on to the next stage of the triple jump – “Step”. No joy was achieved out of “hop” and things are your team member is either operating just as poorly or more likely, even worse. This stage is called “Step” because you need to step it up. Formalise the process, written performance warnings. At the same time, take some action to try to find out why the team member is not responding to you. Assuming they are not just a high functioning sociopath and that you have handled this well so far, it’s time to part ways. Take the Jump. Conversations have been had, warning letters have been given, explanations have been heard and exchanged. Performance has remained either the same or has declined. The only thing left to do now is jump. Now a small warning; even when you have followed all the steps and the law and your own moral compass this stage can still hurt. I’m not actually talking about the soon to be ex-employee, rather I am talking about you – the one pushing the button. It’s hard not to feel an emotion or two when you are going through the final stage. That emotion can be sadness or guilt or fear but it can also stem from anger. Whatever you are feeling in the moment you must say those dreaded words “Bill, I’m going to have to let you go”, put in to one side. Don’t bring emotion to the table for this one. If you are going to be sad about it because Bill is a great bloke with twelve kids and double mortgage, then be sad by yourself after the event. In the meeting, be professional and get the job done. 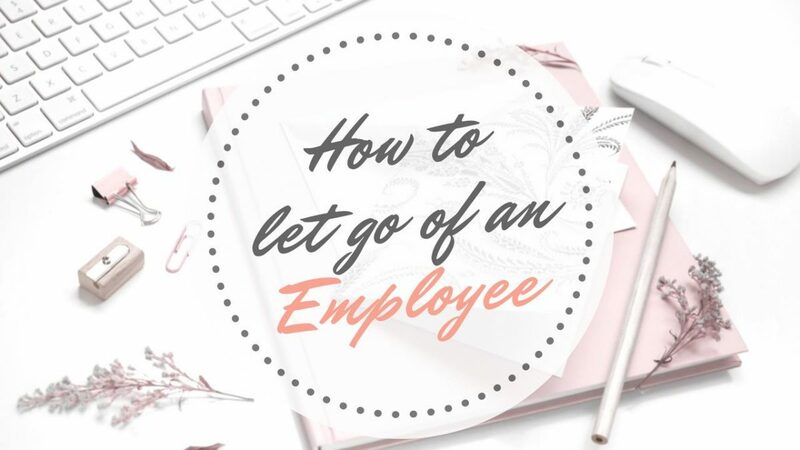 It’s not easy to terminate a team member’s employment. If you have a human side, then you are going to feel it on some level. In the end, you must do what is right for your business. If you feel challenged during or after the process it is important to talk to a mentor or even a workplace psychologist about how you are feeling. What you must avoid though, is sharing these feelings with the remaining team. You are the business owner, the team leader, the captain of your ship and your team look to you for strong leadership and a calm and measured approach. Alistair Way is the senior partner of an Australian consulting firm, Kong and Way Pty Ltd. He has gained extensive experience in senior strategy and operations roles in Australia and South East Asia over the last 20 years.